Food Addiction: How Do You Combat Those Cravings? A whiff of something enticing hits you and you immediately wonder what it is. You have to identify the smell. Before you know it, the scent has started a tango between your brain and your stomach. When you finally walk by a burger joint, pastry shop, or a place serving one of your favorites, it’s hard to turn off the craving. This scene happens to everyone, even if your tummy is full. That’s because everybody has strong connections to different foods. It’s part of everyday life in a world full of potential food addictions. Yes, they’re real, and food addictions are hard to break. But how, exactly, do you know when you’re addicted to a food or beverage? The answers are below. You’ll find out how your tastiest choices consistently register in your memory and what causes food addiction. With that brings the usual internal battles like how to pace or limit yourself in the face of your delicious addictions. You’ll find tips for accomplishing that tough task, too. You have cravings for a variety of foods. There’s nothing to be ashamed of. It’s been scientifically shown that food addiction is an everyday issue some people encounter. So, if you’re dealing with it, you aren’t alone. The cause of food addiction might seem like it starts in your rumbling stomach. But food addiction actually begins in your brain. That’s because it realizes that foods or drinks replete in fat, sugar, or salt are among the most rewarding and pleasurable for certain parts of your brain. Studies have related the chemicals released in the brain when you eat certain foods to those that are released in the presence of an addictive drug. The substance most responsible for this is called dopamine. That fact makes dopamine arguably one of the most impactful and crucial chemicals in your body. It’s a messenger between cells in your brain (also known as a neurotransmitter). And dopamine plays a direct role in how you move around, learn, and digest information—and digest foods, too. This brain chemical is what gets you up and going and helps you stay determined to tackle whatever you have in front of you. But it also plays a key role in food addiction and cravings. 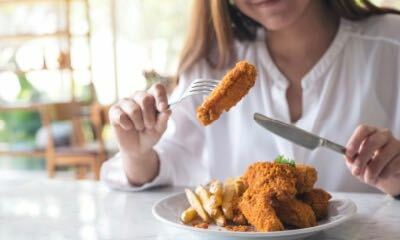 Here’s how dopamine works with food cravings and addiction: Soon after you eat certain foods, this chemical messenger in your brain arrives. Dopamine increases stimulation of your brain’s reward centers. And your brain wants to trigger this reaction again and again. That’s because your brain craves these pleasurable, rewarding experiences. And certain foods are one way for your brain to get its reward fix. Humans aren’t alone in this. In studies where rats were fed diets rich in junk food and unhealthy snacks, the subjects adopted similar behavior to that of habitual drug users. The rats wanted more food that did them no good nutritionally in order to feel eased by the dopamine rush. The rats even refused to dine on more healthy options once they got used to the foods rich in sugar, fats, salt, and carbs. The 2009 study showed rats even went as far as starving in order to wait for the junk food that might never come. That’s a startling example. So, what are the traditional trigger foods and drinks that can influence this process in your brain? Unfortunately, there are a lot. What are Among the Most Addictive Foods? 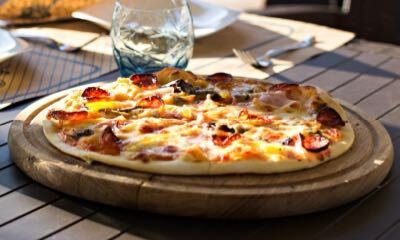 Pizza: Of course, this delicious combination of carbs, salt, and fat is near the top of the list. You’ve probably asked yourself: “How many slices should I eat?” The answer, is one, if any. But pizza is hard to resist. That’s bad, because it’s usually filled with processed ingredients. It also has more fat per bite than most healthy meals. Combine that with the salt and you have a perfect recipe for a flood of dopamine that sets you down a path toward another slice. You know you don’t need it, but your brain wants it. Sweet treats: Chocolate, cookies, cake, and ice cream are all chock-full of sugar and fat that can easily convince your brain that you need more. Offsetting the savory of your meal with a sweet dessert is common. But it isn’t a healthy choice. Those sugars can piggyback an unhealthy main course decision and lead you to overeat when you don’t need to. And you’ll get a lot of extra calories, fat, and sugar, too. Fried foods: From what you already know, there’s no surprise here. French fries and potato chips are salty and usually baked or fried in oils that don’t do your body or brain much good. As out-of-this-world good as fried delicacies can be, at times, they’re the perfect recipe for unhealthy and addictive decision making. As is the case with everything in life, moderation is key. If you’re going to have a glass of red wine at dinner for heart health, have one, not four. 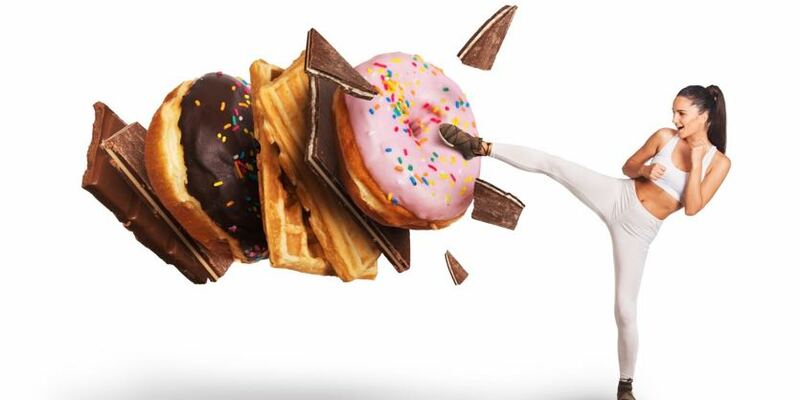 If you’re going to have a cheat day once a week, try and stick to it. Don’t weave your way through the kitchen to plunder your snack drawer every day. Also: It might be wise to avoid having a snack drawer at all. Soft drinks are just as addictive as fatty, salty foods. And consumption of soda has a direct correlation to negative nutritional and health effects, as well as weight gain. One study in 2007 found a clear link between soft drink intake and increased energy intake—in other words, getting more calories in a day. Drinking soda was also associated with lower intake of calcium and other nutrients. Soda drinkers are also at a higher risk for medical issues down the road. So why is soda so addictive? Well, it’s not that hard to decipher. Non-diet soft drinks are filled with a serious amount of sugar. And they sometimes pair the sweet with high levels of caffeine. 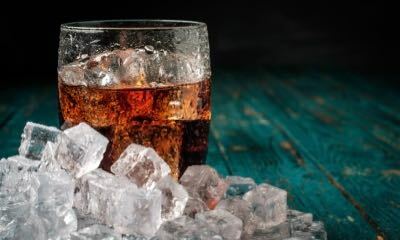 You might counter with, “What about diet soda?” Turns out research shows that diet soft drinks can also contribute to weight gain. Artificial sweeteners are designed to create similar reactions in the brain as normal sugar. And one study suggests those who regularly take in artificial sweeteners may crave more sweets, choose sweet food over nutritious food, and find healthier options like fruit less appealing. This can lead to weight gain. This is the hard part. But you don’t need to feel guilty for a sudden hankering for food or soda. It happens to everyone. And beating yourself up about these cravings isn’t a productive way to deal with food addictions. Understanding what causes these addictions is the first step, but there are more things you can and need to do. Start by planning ahead to figure out how to manage your intake. The expert advice is pretty simple: Get ahead of these urges. That means dumping your snack drawer, and stocking your house with healthier options. Luckily, you can also trick your cravings. If you’re craving a sweet, go the route of natural sugar and have fruit. If you’re looking for something more filling, plan out a meal you know will satisfy—starting with dietary fiber and protein is a good start. 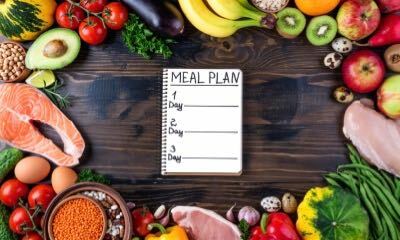 A meal-prep plan for those dealing with food addiction entails spacing out meals throughout the day—anywhere from four to five hours between eating. You should include fresh fruit and vegetables in as many of the snacks and meals as possible. A strong start: Healthy foods might not have the same amount of clout in your memory bank as the sort of foods that set you back in your fight against food addiction. But there are still good substitutes. For example, breakfast foods to put on your list include eggs, granola, bananas and strawberries. Sure, it might take a little longer to prep, but that sounds like a tasty start instead of a Pop Tart or cinnamon roll. Include the fresh stuff: Find the time for fruit and veggies. Getting in the habit of including vegetables and fruit in at least two meals a day is a good start. That will help you turn to fruits and veggies on a regular basis. Making this a habit will help in your fight against unhealthy food addictions. Think ahead: Understand your cravings and try to plan ahead. If you know you love fried foods, find a healthier option—maybe roasted sweet potatoes instead of French fries—and have it ready to go. Making a healthy choice more convenient can help you short-circuit your cravings before they take over. Learn to trick your brain: Dopamine can be released by foods that benefit your stomach and overall health in the long-term, too. In fact, healthy food like spinach, watermelon, avocados, and even tofu, can offer rewarding neurological responses. If you’re looking for alternatives for fatty or salty snacks, carrots and hummus work, as does peanut butter and apple slices. Overcoming food addiction can be a long, painful process. You have to take it meal-by-meal, and day-by-day. But there’s hope. You can do it. And your attitude is a critical part of the battle. Know you can do it. And then start taking small actions and building on them. 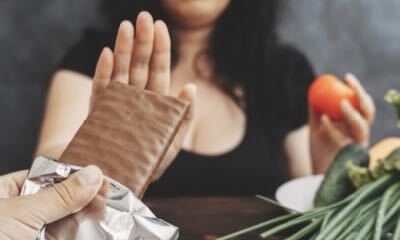 Bookmark this article as a reminder of the science behind food addictions, how they occur, and a step-by-step guide to overcoming them. Start by identifying triggers and then make healthy substitutions. Soon you will have the power to say no to your cravings. Because you will have discovered healthy alternatives you enjoy and you’ll also understand the dangerous path quick-fix foods can present. https://askthescientists.com/wp-content/uploads/2018/10/Woman-fighting-off-food-AdobeStock_215784315.jpg 418 835 Austin Winegar Austin Winegar2018-11-26 10:00:122018-10-01 09:41:02Food Addiction: How Do You Combat Those Cravings?